"Asymptotic" redirects here. It is not to be confused with Asymptomatic. For other uses, see Asymptote (disambiguation). The graph of a function with a horizontal (y = 0), vertical (x = 0), and oblique asymptote (purple line, given by y=2x). A curve intersecting an asymptote infinitely many times. In analytic geometry, an asymptote (/ˈæsɪmptoʊt/) of a curve is a line such that the distance between the curve and the line approaches zero as one or both of the x or y coordinates tends to infinity. Some sources include the requirement that the curve may not cross the line infinitely often, but this is unusual for modern authors. In projective geometry and related contexts, an asymptote of a curve is a line which is tangent to the curve at a point at infinity. The word asymptote is derived from the Greek ἀσύμπτωτος (asumptōtos) which means "not falling together", from ἀ priv. + σύν "together" + πτωτ-ός "fallen". The term was introduced by Apollonius of Perga in his work on conic sections, but in contrast to its modern meaning, he used it to mean any line that does not intersect the given curve. There are three kinds of asymptotes: horizontal, vertical and oblique asymptotes. For curves given by the graph of a function y = ƒ(x), horizontal asymptotes are horizontal lines that the graph of the function approaches as x tends to +∞ or −∞. Vertical asymptotes are vertical lines near which the function grows without bound. An oblique asymptote has a slope that is non-zero but finite, such that the graph of the function approaches it as x tends to +∞ or −∞. More generally, one curve is a curvilinear asymptote of another (as opposed to a linear asymptote) if the distance between the two curves tends to zero as they tend to infinity, although the term asymptote by itself is usually reserved for linear asymptotes. Asymptotes convey information about the behavior of curves in the large, and determining the asymptotes of a function is an important step in sketching its graph. The study of asymptotes of functions, construed in a broad sense, forms a part of the subject of asymptotic analysis. graphed on Cartesian coordinates. The x and y-axes are the asymptotes. The idea that a curve may come arbitrarily close to a line without actually becoming the same may seem to counter everyday experience. The representations of a line and a curve as marks on a piece of paper or as pixels on a computer screen have a positive width. So if they were to be extended far enough they would seem to merge, at least as far as the eye could discern. But these are physical representations of the corresponding mathematical entities; the line and the curve are idealized concepts whose width is 0 (see Line). Therefore, the understanding of the idea of an asymptote requires an effort of reason rather than experience. , 100, 1,000, 10,000 …, become larger and larger. So the curve extends farther and farther upward as it comes closer and closer to the y-axis. Thus, both the x and y-axes are asymptotes of the curve. These ideas are part of the basis of concept of a limit in mathematics, and this connection is explained more fully below. The asymptotes most commonly encountered in the study of calculus are of curves of the form y = ƒ(x). These can be computed using limits and classified into horizontal, vertical and oblique asymptotes depending on their orientation. Horizontal asymptotes are horizontal lines that the graph of the function approaches as x tends to +∞ or −∞. As the name indicates they are parallel to the x-axis. Vertical asymptotes are vertical lines (perpendicular to the x-axis) near which the function grows without bound. Oblique asymptotes are diagonal lines such that the difference between the curve and the line approaches 0 as x tends to +∞ or −∞. is the limit as x approaches a from the right. and the curve has a vertical asymptote x=1. has a limit of +∞ as x → 0+, ƒ(x) has the vertical asymptote x = 0, even though ƒ(0) = 5. The graph of this function does intersect the vertical asymptote once, at (0,5). It is impossible for the graph of a function to intersect a vertical asymptote (or a vertical line in general) in more than one point. Moreover, if a function is continuous at each point where it is defined, it is impossible that its graph does intersect any vertical asymptote. A common example of a vertical asymptote is the case of a rational function at a point x such that the denominator is zero and the numerator is non-zero. So the line y = −π/2 is a horizontal asymptote for the arctangent when x tends to −∞, and y = π/2 is a horizontal asymptote for the arctangent when x tends to +∞. , the y-axis (x = 0) and the line y = x are both asymptotes. In the first case the line y = mx + n is an oblique asymptote of ƒ(x) when x tends to +∞, and in the second case the line y = mx + n is an oblique asymptote of ƒ(x) when x tends to −∞. The asymptotes of many elementary functions can be found without the explicit use of limits (although the derivations of such methods typically use limits). depending on the case being studied. It is good practice to treat the two cases separately. If this limit doesn't exist then there is no oblique asymptote in that direction. where a should be the same value used before. If this limit fails to exist then there is no oblique asymptote in that direction, even should the limit defining m exist. Otherwise y = mx + n is the oblique asymptote of ƒ(x) as x tends to a.
so that y = 2x + 3 is the asymptote of ƒ(x) when x tends to +∞. , which does not exist. So y = ln x does not have an asymptote when x tends to +∞. A rational function has at most one horizontal asymptote or oblique (slant) asymptote, and possibly many vertical asymptotes. The degree of the numerator and degree of the denominator determine whether or not there are any horizontal or oblique asymptotes. The cases are tabulated below, where deg(numerator) is the degree of the numerator, and deg(denominator) is the degree of the denominator. The vertical asymptotes occur only when the denominator is zero (If both the numerator and denominator are zero, the multiplicities of the zero are compared). For example, the following function has vertical asymptotes at x = 0, and x = 1, but not at x = 2.
shown to the right. As the value of x increases, f approaches the asymptote y = x. This is because the other term, 1/(x+1), approaches 0. If the degree of the numerator is more than 1 larger than the degree of the denominator, and the denominator does not divide the numerator, there will be a nonzero remainder that goes to zero as x increases, but the quotient will not be linear, and the function does not have an oblique asymptote. If a known function has an asymptote (such as y=0 for f(x)=ex), then the translations of it also have an asymptote. If a known function has an asymptote, then the scaling of the function also have an asymptote. For example, f(x)=ex-1+2 has horizontal asymptote y=0+2=2, and no vertical or oblique asymptotes. (sec(t), cosec(t)), or x2 + y2 = (xy)2, with 2 horizontal and 2 vertical asymptotes. A line ℓ is an asymptote of A if the distance from the point A(t) to ℓ tends to zero as t → b. From the definition, only open curves that have some infinite branch can have an asymptote. No closed curve can have an asymptote. For example, the upper right branch of the curve y = 1/x can be defined parametrically as x = t, y = 1/t (where t > 0). First, x → ∞ as t → ∞ and the distance from the curve to the x-axis is 1/t which approaches 0 as t → ∞. Therefore, the x-axis is an asymptote of the curve. Also, y → ∞ as t → 0 from the right, and the distance between the curve and the y-axis is t which approaches 0 as t → 0. So the y-axis is also an asymptote. A similar argument shows that the lower left branch of the curve also has the same two lines as asymptotes. which tends to zero simultaneously as the previous expression. This parameterization is to be considered over the open intervals (a,b), where a can be −∞ and b can be +∞. are real numbers. All three types of asymptotes can be present at the same time in specific examples. Unlike asymptotes for curves that are graphs of functions, a general curve may have more than two non-vertical asymptotes, and may cross its vertical asymptotes more than once. Let A : (a,b) → R2 be a parametric plane curve, in coordinates A(t) = (x(t),y(t)), and B be another (unparameterized) curve. Suppose, as before, that the curve A tends to infinity. The curve B is a curvilinear asymptote of A if the shortest distance from the point A(t) to a point on B tends to zero as t → b. Sometimes B is simply referred to as an asymptote of A, when there is no risk of confusion with linear asymptotes. has a curvilinear asymptote y = x2 + 2x + 3, which is known as a parabolic asymptote because it is a parabola rather than a straight line. Asymptotes are used in procedures of curve sketching. An asymptote serves as a guide line to show the behavior of the curve towards infinity. In order to get better approximations of the curve, curvilinear asymptotes have also been used  although the term asymptotic curve seems to be preferred. A cubic curve, the folium of Descartes (solid) with a single real asymptote (dashed). The asymptotes of an algebraic curve in the affine plane are the lines that are tangent to the projectivized curve through a point at infinity. For example, one may identify the asymptotes to the unit hyperbola in this manner. Asymptotes are often considered only for real curves, although they also make sense when defined in this way for curves over an arbitrary field. A plane curve of degree n intersects its asymptote at most at n−2 other points, by Bézout's theorem, as the intersection at infinity is of multiplicity at least two. For a conic, there are a pair of lines that do not intersect the conic at any complex point: these are the two asymptotes of the conic. the curve has a singular point at infinity which may have several asymptotes or parabolic branches. , but its highest order term gives the linear factor x with multiplicity 4, leading to the unique asymptote x=0. Hyperbolas, obtained cutting the same right circular cone with a plane and their asymptotes. The distance between the hyperboloid and cone approaches 0 as the distance from the origin approaches infinity. defines a cone which is centered at the origin. It is called an asymptotic cone, because the distance to the cone of a point of the surface tends to zero when the point on the surface tends to infinity. ^ Oxford English Dictionary, second edition, 1989. ^ Apostol, Tom M. (1967), Calculus, Vol. 1: One-Variable Calculus with an Introduction to Linear Algebra (2nd ed. ), New York: John Wiley & Sons, ISBN 978-0-471-00005-1 , §4.18. ^ Pogorelov, A. V. (1959), Differential geometry, Translated from the first Russian ed. by L. F. Boron, Groningen: P. Noordhoff N. V., MR 0114163 , §8. ^ Fowler, R. H. (1920), The elementary differential geometry of plane curves, Cambridge, University Press, hdl:2027/uc1.b4073882, ISBN 0-486-44277-2 , p. 89ff. ^ Coolidge, Julian Lowell (1959), A treatise on algebraic plane curves, New York: Dover Publications, ISBN 0-486-49576-0, MR 0120551 , pp. 40–44. ^ Kunz, Ernst (2005), Introduction to plane algebraic curves, Boston, MA: Birkhäuser Boston, ISBN 978-0-8176-4381-2, MR 2156630 , p. 121. ^ P. Frost Solid geometry (1875) This has a more general treatment of asymptotic surfaces. 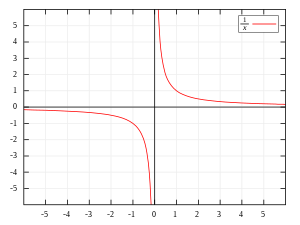 Wikimedia Commons has media related to Asymptotics.